Coiscéim, 2011, x + 299 lgh. Cad as a dtángamar mar náisiún? Cérbh iad laochra agus cladhairí ár staire? Cérbh iad na tubaistí agus na héachtaí a mhair i gcuimhne an phobail? Cérbh iad cuspóirí agus dílseachtaí na nglún a chuaigh romhainn? Dlúthchuid d’fhéiniúlacht gach tíre is ea an leagan den stair a gcreideann a muintir ann. Sa leabhar seo, mínítear conas a cumadh insint shainiúil Ghaelach ar stair na hÉireann sa 17ú céad, conas a craobhscaoileadh agus a saothraíodh í san 18ú céad agus conas a buanaíodh í sa 19ú céad. Scaipthe tríd an leabhar tá cúig cinn de dhánta stairiúla a léiríonn fás agus leanúnachas an traidisiúin dúchais staire ón 16ú céad i leith. Ina measc tá ‘Tuireamh na hÉireann’, an aiste is coitianta i lámhscríbhinní na Gaeilge agus ceann de na haistí liteartha is tábhachtaí dár cumadh in Éirinn riamh. Tá an leabhar seo le ceannach go díreach ó na foilsitheoirí nó tríd an suíomh litriocht.com. Tá innéacs an leabhair le fáil anseo mar chomhad PDF. "Is cinnte gur saothar acadúil é ach tá beocht ann as an gcoitiantacht ... Mholfainn é don té a bhfuil aon tsuim aige sa stair nó sa litríocht." Micheál Ó hUanacháin, 'Ardán na nEalaíon', Raidió na Gaeltachta, 28 Eanáir 2012. "What happened to the Gaelic-and-associated Catholic Irish was so drastic that it makes it tempting to see them in their 19th century selves as 'new men', 'blank pages', and so on ... However, there was also a deeper continuity in terms of historical and national consciousness. Vincent Morley's great merit (in Ó Chéitinn go Raiftearaí) is that he has shown this more clearly than anyone had shown it before. In the early nineteenth century a view of Irish history was brought over from the Irish language and relaunched in English." John Minahane, Irish Political Review, April 2012, 19. "Is é an rud atá déanta aige, mar sin, ná go ngabhann sé tríd na slite gur chuamar i ngleic leis na foinsí dúchais, ag tosnú le fírinne leis na hannála agus le Foras Feasa ar Éirinn, agus ina dhiaidh sin an tslí gur deineadh dánta astusan agus gur mhair na dánta ar bhéalaibh daoine, agus gur mhair na dánta i measc an phobail, agus gurbh í seo an tuiscint a bhí ag daoine ar stair na hÉireann, agus gur chuaigh an tuiscint sin isteach sa Bhéarla ag túis an 19ú haois agus isteach i dtuiscintí gnáthmhuintir na hÉireann go dtí an lá atá inniu ann." Alan Titley, 'Comhluadar na Leabhar', Raidió na Gaeltachta, 12 Bealtaine 2012. "Measaim gur sár-obair é seo mar, thar aon rud eile go n-aontaím leis, nach n-úsáideann staraithe proifisiúnta na foinsí i nGaeilge ... faigheann tú arís agus arís eile nach bhfuil aon eolas, ná nach dtuigeann staraithe go minic, go bhfuil an oiread sin eolais le fáil sna foinsí Gaeilge. Breathnaítear orthu mar fhoinsí litríochta agus ní mar fhoinsí staire agus sin ceann desna pointí is tabhachtaí ag Vincent anseo." Edel Bhreathnach, 'Comhluadar na Leabhar', Raidió na Gaeltachta, 12 Bealtaine 2012. "Sa leabhar thar a bheith suimiúil seo téann Vincent Morley i ngleic leis an teoiric gur chruthaigh intleachtóirí meánaicmeacha náisiúnachas na hÉireann san 18ú agus sa 19ú céad, agus gur i mBéarla a tharla sé ... Toisc nach bhfuil Gaeilge ag go leor staraithe, déanann siad neamhaird de na bunfhoinsí a scríobhadh sa teanga. Dá mba rud é gur tharla sé i nGaeilge níor tharla sé ar chor ar both, is cosúil. Ardsaothar atá anseo." Colm Ó Broin, Gaelscéal, 25 Iúil 2012. "Morley's work demonstrates the flaws in Jürgen Habermasʼs theory of public space, ignoring as it does the multiple interactions between orality, manuscripts and print in early modern England. What was true for England, was a fortiori true for Ireland and for much longer. In arguing for the priority of Irish language sources and manuscript materials in tracing the growth of the nationalistic version of Irish history, Morley offers a timely riposte to those who claim it to be a nineteenth-century construct." Mícheál Mac Craith, Irish Historical Studies, May 2012. "Níl sa choimriú seo ar phríomh-théamaí an tsaothair ach blaiseadh beag den lón breá machnaimh atá sa leabhar. Bheadh sé go deas dá bhféadfaí a rá go mbeidh an leabhar seo á léamh, agus á phlé go fairsing sna hirisí staire, ag na staraithe gairmiúla a dtugtar ómós dóibh mar shaineolaithe ar stair na hÉireann ón 17ú go dtí an 19ú céad. Ach, is féidir, agus is trua, nach mar sin a bheidh, de bhrí gur chompántas an-bheag é an compántas staraithe ar an dtréimhse seo a bhfuil dóthain Gaeilge acu chun an leabhar a léamh, ní áirím-se breithiúnas meáite a thabhairt ar na foinsí a úsáideann Morley agus ar an áitiú a dhéanann sé. Ach ní ar Vincent Morley atá an milleán faoi theirce na buíne cáilithe seo. Tá a chion déanta aige mar scoláire." Gearóid Ó Tuathaigh, Journal of the Galway Archaeological and Historical Society, 64 (2012). "Vincent Morley’s outstanding and innovative study, Ó Chéitinn go Raiftearaí, paints a rather different picture of the historical culture of the Irish-speaking populace." Barra Ó Seaghdha, Dublin Review of Books, November 2012. "Saothar é seo ar a bhfuil lorg na scoláireachta i litríocht agus stair na hÉireann le sonrú go láidir. Tá an stíl soiléir agus is mór an buntáiste é sin agus ábhar substaintiúil á cur i láthair an léitheora ... Deir an t-údar: 'dá mbeadh orm éirim an leabhair seo a chur i bhfocal amháin, is é "leanúnachas" an focal a roghnóinn'. Éiríonn go seoigh leis léargas a thabhairt ar an leanúnachas sa chultúr, sa stair, sa phobal." Criostóir Mac Amhlaoibh, Feasta, Samhain 2012. "Is leabhar tábhachtach é seo, mar sin, a chuireann i láthair go córasach áiteamh atá le cloisteáil le fada an lá i saol acadúil na Gaeilge agus a shamhlaítear ach go háirithe le scoláireacht Bhreandáin Uí Bhuachalla ... Ach níl ceilt ar a inspeise is atá an tsintéis seo ó Vincent Morley agus ar a inúsáidte is a bheidh Ó Chéitinn go Raiftearaí mar leabhar acu siúd ar mian leo teacht ar fhoinsí stairthuiscint na nGael." Proinsias Ó Drisceoil, Comhar, Nollaig 2012. "Morley's new work ranks alongside Máirín Nic Eoin's Trén bhFearann Breac: An Díláithriú Cultúir agus Nualitríocht na Gaeilge (2005) ... and Brian Ó Conchubhair's Fin de Siècle na Gaeilge: Darwin, An Athbheochan agus Smaointeoireacht na hEorpa (2009) ... as one of those books that is hugely significant in re-evaluating core aspects of Irish political, cultural and historical experience." Michael Cronin, Dublin Review of Books, March 2013. 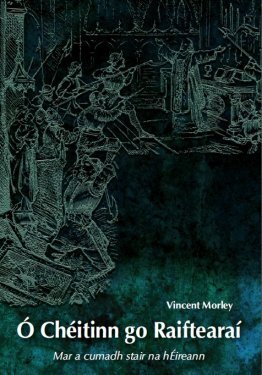 "Morley’s analysis of the major historical themes of the eighteenth century suffers from a lack of context that would be provided if English-language writing on Irish history in the same period, and on the same themes, had also been considered in parallel. This context is lacking. Even in using secondary sources, Morley is assiduous in citing material published in Irish while inclined to ignore those who write in English ... This book appears to be addressed to those Irish language readers of the twenty-first century who seek to have traditional assumptions about the role of culture and language in the Irish past affirmed rather than challenged." Bernadette Cunningham, The Irish Review, 46, autumn 2013. "Is saothar cuimsitheach dea-scríofa é seo a fhreastalaíonn ar phobal leathan, idir scoláirí agus léitheoirí eile ar spéis leo stair agus litríocht na hÉireann. Tá dua caite le leagan amach an leabhair ... is saothar tábhachtach taighde é, saothar a phléann le mionsonraí agus le mórshonraí na staire araon, ó pheirspictíocht na nGael. Is leabhar spreagúil é a chuireann go mór lenár dtuiscint ar an insint dhúchasach ar stair na hÉireann agus ar an ngreim a bhí aici ar mheon na muintire." Deirdre Nic Mhathúna, Studia Hibernica, 40, 2014.